Thank you for making this workshop so enjoyable! Thank you for such an inspiring class. You shared a great many tips and ideas. Your videos were very informative, but sometimes difficult to hear. I appreciate the time and effort that you invested in the class. 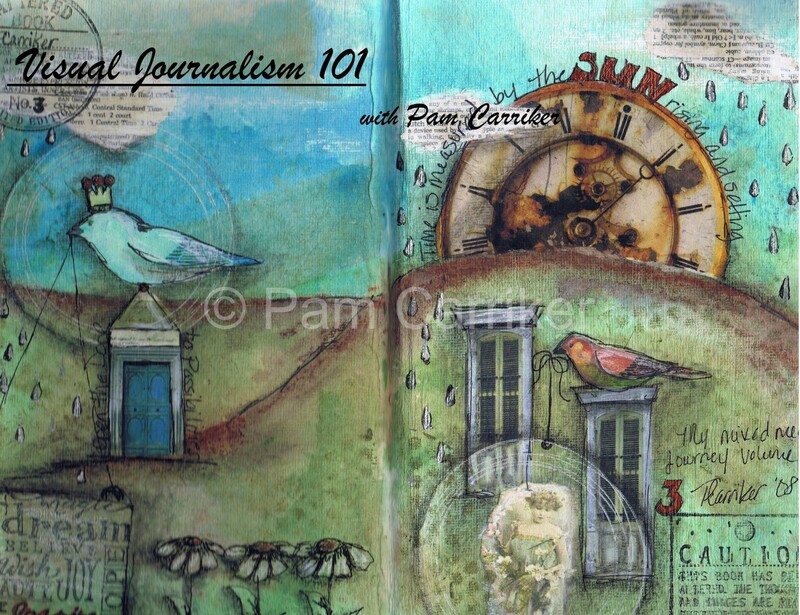 Pam – Your Journaling Workshop has opened up a new way of thinking. I greatly appreciated you sharing all of your techniques and then following up with videos that truly guide you through the process. Its one thing to read but when you can actually visually see how is done is priceless. Since I am a visual learner these videos are very important to me. Thank you and I look forward to taking your next class. The Best to you,Sue B.
Hi Pam, I have so enjoyed the class, I really hate for it to end! I haven’t viewed the final video yet, but the written part looks great. Pam, the class was a lot of fun and I really enjoyed it. Visual journaling is such a relaxing tool to use in your life. I especially enjoyed the segment on the shading with the charcoal pencils and will start using this more in my journals. Your shades of grey workshop shounds fun too and I hope to be able to do that one as well. Hi Pam! I’ve enjoyed this class SO much and initially was saddened to see it come to an end so quickly (at least to me it went too fast)…however, I was SO excited to see you offering another one, and more than excited to see it on shades of grey! I’ve loved reading all about your Pitt pens on your blog! Art journaling isn’t quite as scary to me now that I know how to start. Thank you for a wonderful class! Pam, this has been wonderful! what an exciting experience to “see” how you work! Thanks for sharing some of your secrets! I loved every minute! Thanks for a wonderful class Pam. You are an excellent teacher and I’ve learned so much from you. Thank you for pulling this together. thanks for teaching this class. i’ve learned a great deal and looking forward to learning more in future classes. Hi Pam, I just wanted to say how much I enjoyed your class. I learned so much from you. I know I will continue to play in my journal because of your inspiration. I’m sorry to see the class ending. Hopefully I will be taking more from you in the future. Thanks again for sharing all your wonderful techniques with us. Hi Pam,Like all the ladies above me, I have also thoroughly enjoyed the workshop. I am still working on several of my pages and can’t wait now to add some of the final touches. Seeing everyone’s work on flickr has been brilliant too. Thank you so much for all the inspiration! This was my first online workshop and it was fantastic Pam…I am already registered for the Pitt Pen class and can’t wait until March. Thank you for sharing all of your secrets during the last several weeks…it’s been a wonderful journey.